Hello Readers, did you miss my posts? Did you notice my absence? If so, thank you so much for the concern and inquiries, it means a lot to me. I was not simply ignoring the blog, but was deep in a hectic schedule for the last couple of weeks. My hubby was travelling as part of his job and it was crazy couple of weeks.... I had to manage everything by myself. My parents were here to help me for one week, which was a great relief but when they left I was like 'Where should I start?'. Anyway things are back to normal and I am almost back into schedule. Last Saturday marked a memorable day in my life. Yes, I took part in the first race in my life, the 5k that I had mentioned in one of my previous posts. I am still shocked how I finished the run with a better timing than my practice runs even though the temperature was in the 40s and I was dragging myself to the finishing line. Couple of my friends was there for the race and it was a ladies time together without worrying about family & kids. The husbands took care of the kids and we had a gala time together. It was an unexplainable achievement. Things that I would have never dreamt about doing in my life were given priority and executed in a satisfactory manner. The zeal for the race has improved ever since the 5k and we are looking forward for such events in the future. Let me come back to today's post. Nathan loves Nutella in any form, but the other two are not that keen about it. I had my eyes on this bread when I found this on pinterest few months ago. My first attempt was well received by my family and it was a complete adaption of the recipe from InspiredByCharm. In my second attempt, I tried some variations and it was totally delicious. I was able to share it with my friends after the race and they too enjoyed it. So here is something you can try if you are a Nutella fan. 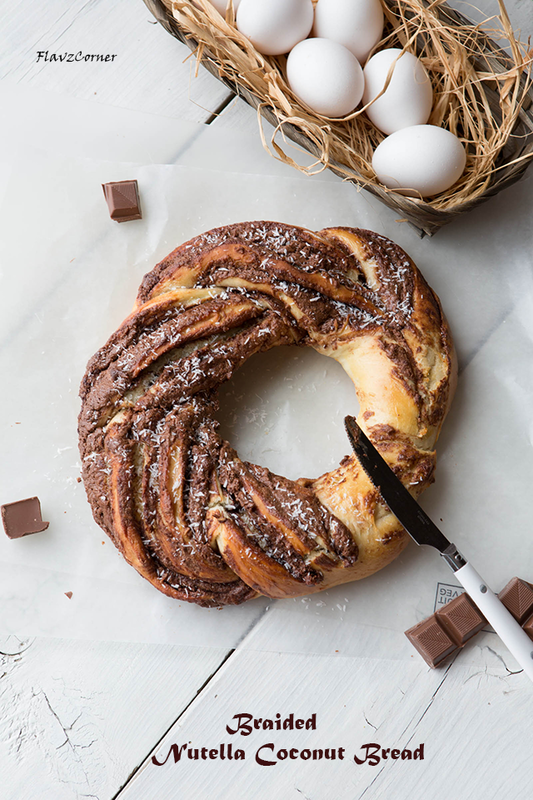 You can go as simple as you can with this bread by not braiding and simply filling the dough with Nutella and bake it as one long bread. But if you like to create sassy looking bread, follow the recipe and you will end up with fancy looking bread. Hope you will try one of the versions. Mix 1 tsp of sugar, 1/2 tsp of yeast in 1/4 cup of lukewarm water and set it aside in warm area to proof for 10 minutes. Once the yeast mixture becomes frothy, add it to a mixing bowl of a stand mixture with beaten eggs, sugar, salt, flour and water. Attached the hook and knead it for 5 minutes. You can also knead the dough using hands till the dough forms a ball and pulls away from the sides of the bowl. Apply 1/2 tsp of oil on the dough; cover and keep in warm place to rise for 1 hr or till the volume gets double in size. Warm the Nutella in microwave for 20 seconds. Punch down the dough and knead it using hands over a floured surface for 2 minutes. 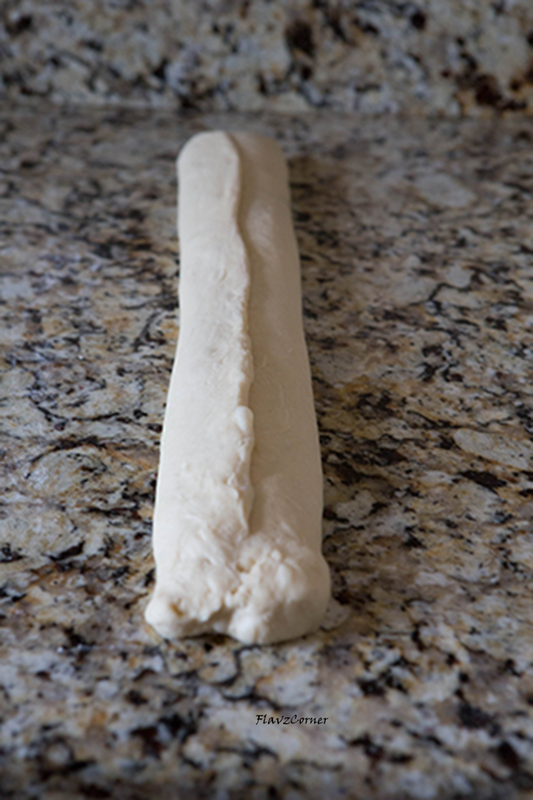 Roll the dough into a rectangle roughly 12 x 15'' size. 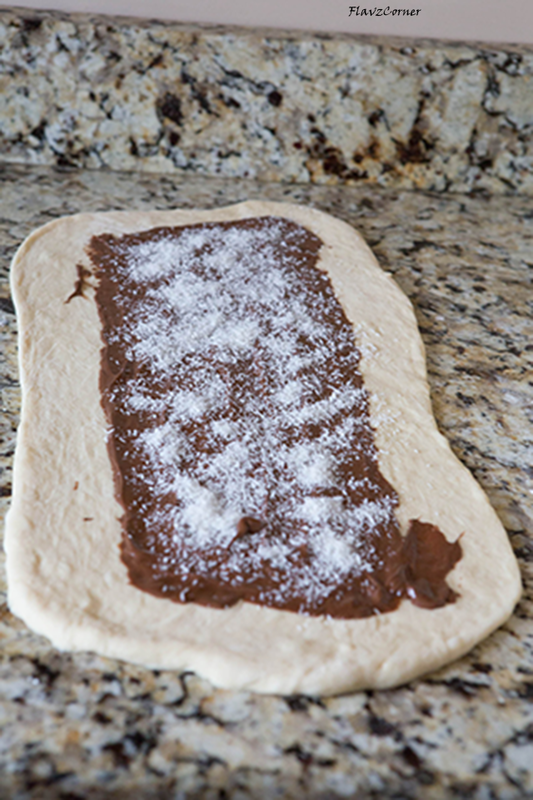 Spread the Nutella on the rolled dough leaving 1 cm space on the sides. Sprinkle 1/4 cup of desiccated coconut on the utella. Roll the dough starting at the long side to the other end. Pinch the ends tight and place the seem end at the bottom. Now using a serrated knife cut the rolled log shaped dough in the middle into 2 leaving one end intact. Now carefully twist the cut end facing upwards so that the Nutella can be seen. Now start braiding by twisting them one over another. Pinch the ends together. 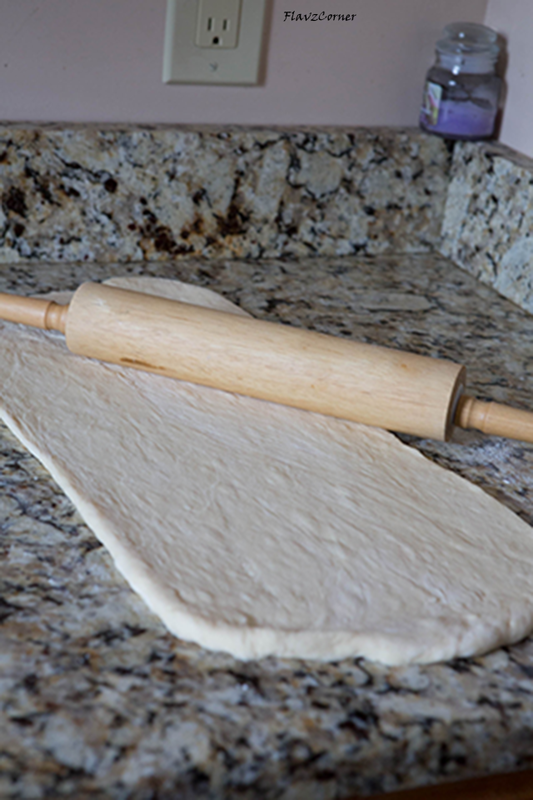 Make sure you use enough flour on the dough and the rolling surface to make it workable. Grease the outer side of a small non-stick cake mold or a small round bakeware. Line a baking sheet with parchment paper. Now the tricky part is to transfer the wobbly twisted dough on to the baking sheet. I used a plastic thin cutting pad and slide it under the braided dough. Place the greased bakeware in the middle of the baking sheet. Now gently slide the braided dough on to the baking sheet and wrap it around the greased bakeware as shown in the above picture to form a circle around the bakeware and pinch the ends. 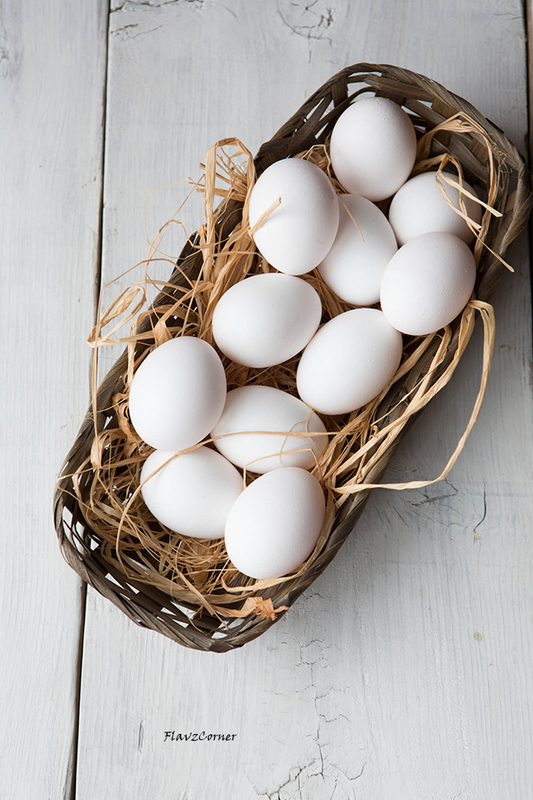 Mix 1 tbsp of beaten egg with 1 tsp of water and brush it on the exposed dough. Bake for 20 minutes in the middle rack. Take the bread out and increase the temperature to 425°F and bake for 5 more minutes or till golden brown on the top. Sprinkle desiccated coconut above the bread and enjoy. The bread can be kept outside for 2 days. It is better to warm the bread in microwave for 20 seconds before enjoying it as they tend to harden when left outside for hours. 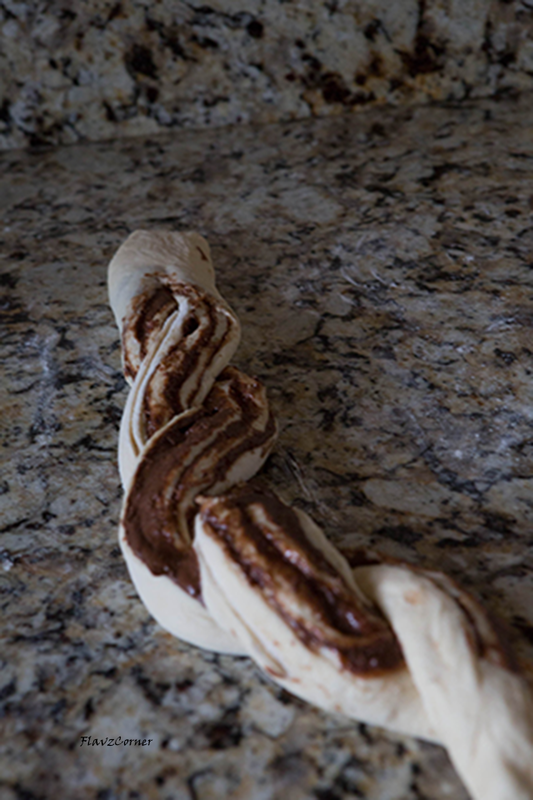 It is little messy and tricky to braid the cut dough. 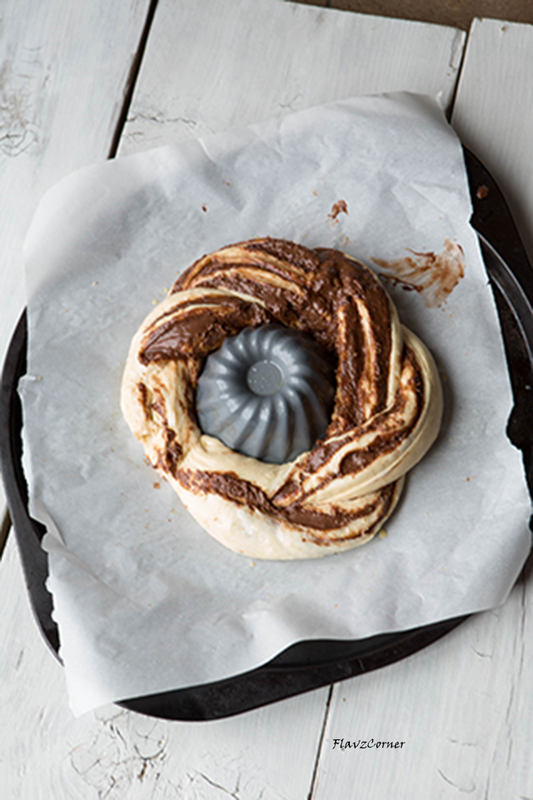 If you don't care for the braided shape, you can just bake it without cutting and braiding. Just apply the egg wash and follow the baking instructions. 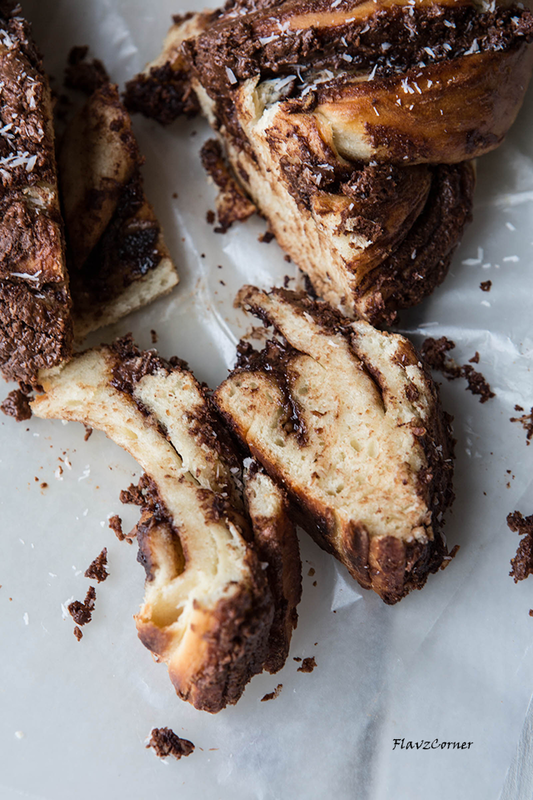 Baked a similar one with cinnamon sugar before, but I love yours with nutella even more. It looks scrumptious! Looks so good! I love braided bread but always get scared of making these. Yours look so professional! Bread looks so delicious... that second pic of the eggs is so good.. Welcome back! I did indeed miss you, and was wondering. I just assumed real life happened. ;-) Great bread! Love the flavors in this -- thanks. Congrats on your first 5K! That's awesome! And this bread.... oh my gosh it looks beyond amazing!! Looks so appetizing, my god!!! Excellent idea! Congrats on your first 5K!!! This bread would be a purfect post run treat! delish!